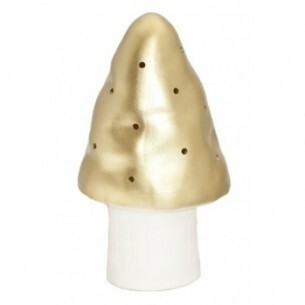 Give a quirky touch to the nursery or your child’s bedroom with this stylish mushroom lamp by Egmont Toys/ Heico. The mushroom lamp casts a wonderful warm light. The little holes on the top of the mushroom let the light escape, creating an enchanting star effect to the walls. Perfect as a bedtime reading lamp, nightlight and for when nursing your baby at night. 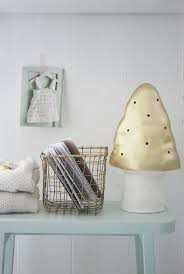 Can be placed on the floor, a bedside cabinet or window sill and looks just as good switched off as on. 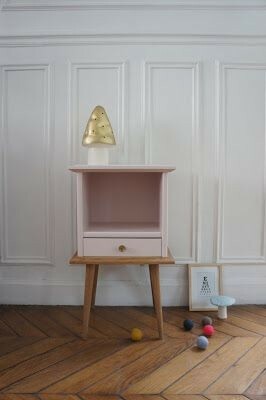 Egmont Toys/ Heico designed lamps are world-renowned for quirky, original design and quality German-made products. Each lamp is hand painted to a very high standard. A unique and stunning gift that your little one will cherish for a lifetime. New York Magazine have declared Heico lamps to be “The coolest night-lights on the block” and it's easy to see why! The mushroom lamp’s light is so soft that you can use the lamp as a night light. It is supplied with a CE certified 240v switchable children’s lamp fitting (E14, small screw candle type) and 15w bulb. Available in eight quirky colours.